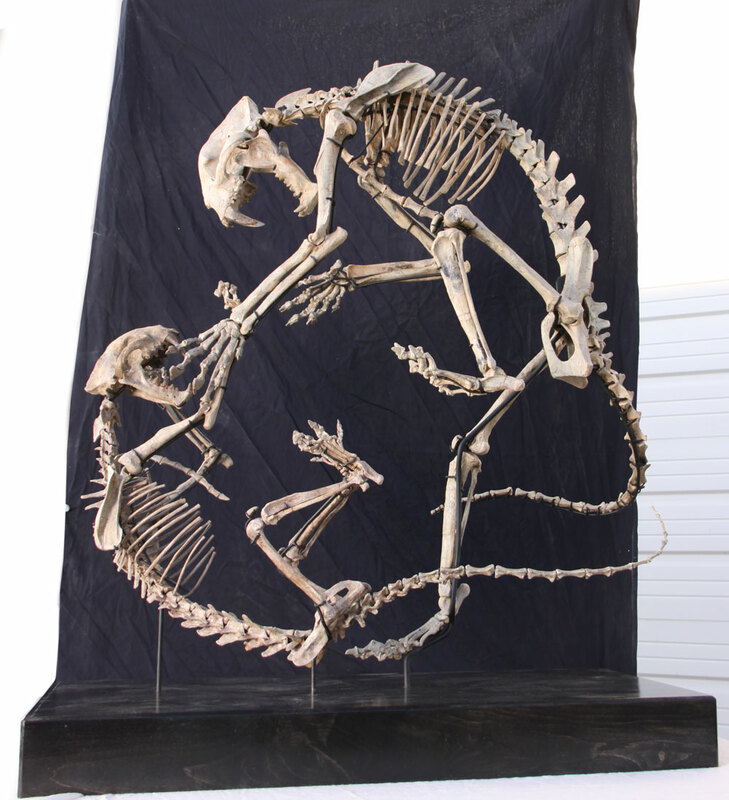 A truly rare offering of two fully articulated, uniquely mounted saber-toothed carnivores (Dinictis felina), these specimens represent a virtually complete fossilized skeleton—in an exciting and dynamic pose. No comparable display specimens of the same quality and originality exist in either private or museum collections. 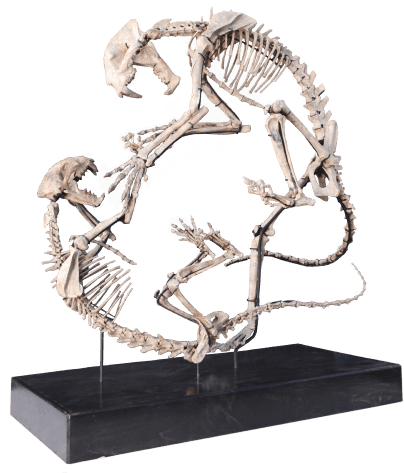 Beautifully preserved, the Dueling Dinictis skeletons are accurately and scientifically reconstructed, enhancing their integrity. This display is prestigious, unmatched in its aesthetic appeal (ranking high as a collectable, with great investment potential).  The external appearance of Dinictis has been inferred by studying its skeletal structure, shedding some light on its lifestyle. 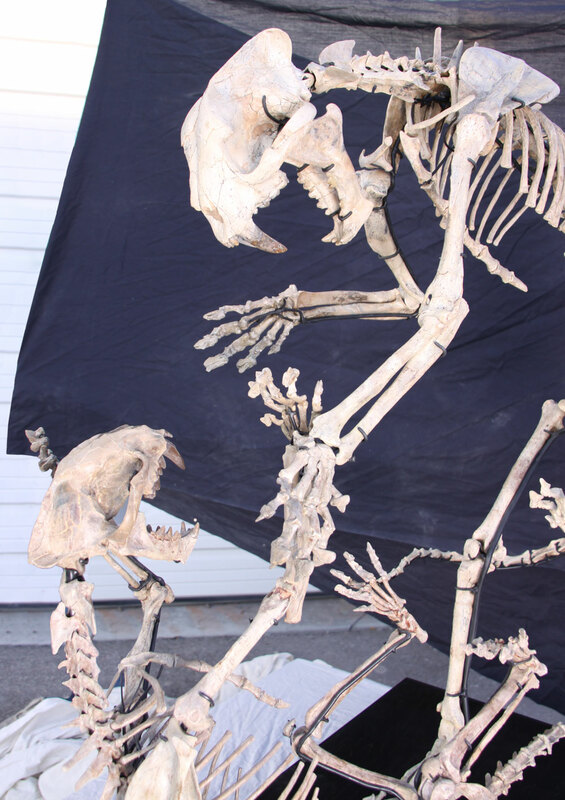 The Dinictis’ overall body proportions were not so different from non-extinct felidae’s—roughly the size and weight of a jaguar or leopard. The powerful front limb bones indicate that they hunted prey greatly exceeding their own body weight. 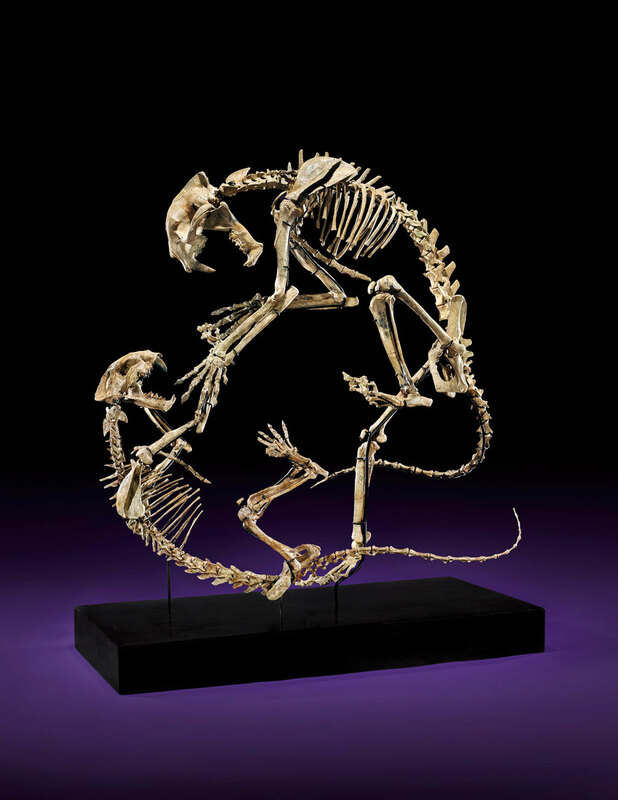 The Dinictis’ feet bones are shorter than modern felidae, but “digitigrade” (i.e., stepping with one’s toes, not heels)—so walking was graceful and deliberate. The Dinictis’ most revealing features are found in its skull and teeth. The shortened cranium is designed to accommodate its dagger-like upper canines—used for stabbing and bleeding its prey during the killing process. Millions of years before members of the cat family (felidae) evolved into the now well-known saber-tooth, a group of primitive carnivores, now extinct, had already adapted themselves to this specialized niche. These were the Nimravidae, which diversified into many of the specializations we see in living felidae. In addition to developing a saber-toothed morphology, Nimravidae claimed the predatory niches occupied by today’s various types of wildcat, leopard, lion, and cheetah. As seen in fossils from the Eocene epoch of North America—approximately 50 million years ago—the Nimravidae had already acquired many of the diagnosistic features of the family. These ancestral species had already developed small chin flanges, reduced lower canines with diastema, simple dentition, and many other incipient characteristics associated with smilodonty—the genera Uintacyon, Vassacyon, and Topocyon are some of the oldest Nimravidae known. During the Oligocene epoch, advanced forms such as Dinictis, Nimravus, Dinaelurus, and Pogonodon evolved, survived, and flourished. During most of the Oligocene epoch, Dinictis became widespread and diverse, reaching the size of leopards. 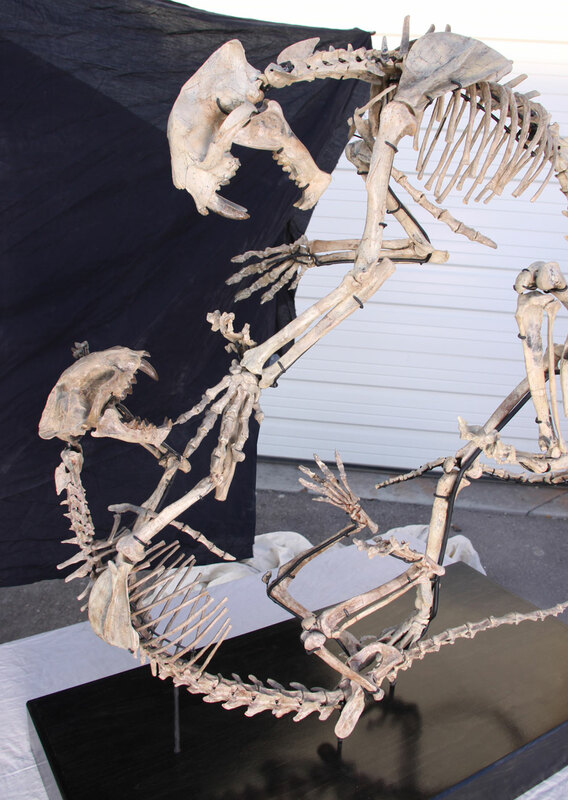 The decline of hyaenodontidae during the same time may have allowed species of Dinictis to evolve into a larger, more dominate type of saber-toothed carnivore. 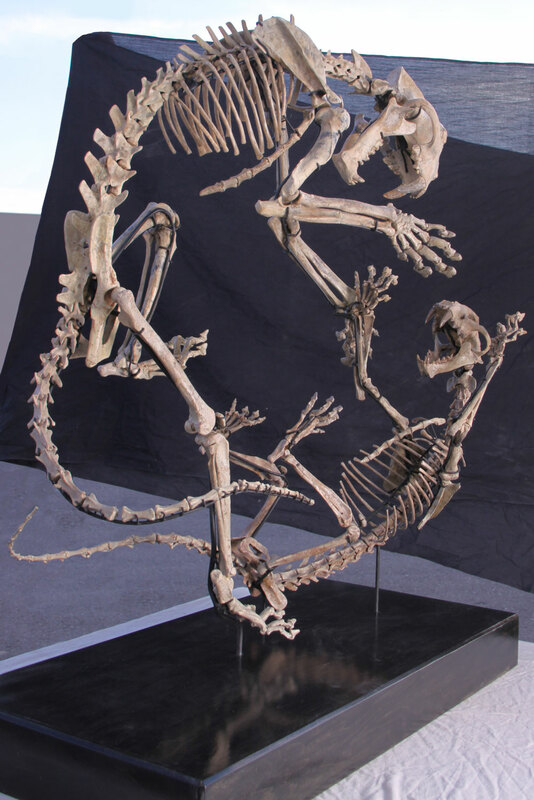 The fossil record indicates that the evolutionary history of Dinictis is restricted to the Late Oligocene of North America. Members of the Nimravidae family, on the other hand, ranged throughout North America and Eurasia for most of the Eocene, Oligocene, and Miocene epochs. Nimravids entered Africa in the Miocene epoch but never reached the South American continent. Recent classification for the Nimravidae has included the subfamilies Barbourfelinae and the Nimravinae. The Barbourfelinae are now considered separated and can be placed as a basal group within the Feliformia. Thus, members of the Nimravidae can be considered in Caniformia and restricted to the following genera: Uintacyon, Vassacyon, Topocyon, Dinictis, Nimravus, Dinailurictis, Quercylurus, Dinaelurus, and Pogonodon. Locality: White River Badlands, Northeast Shannon County, South Dakota. Date Collected: 1998–99, in two separate private ranches. 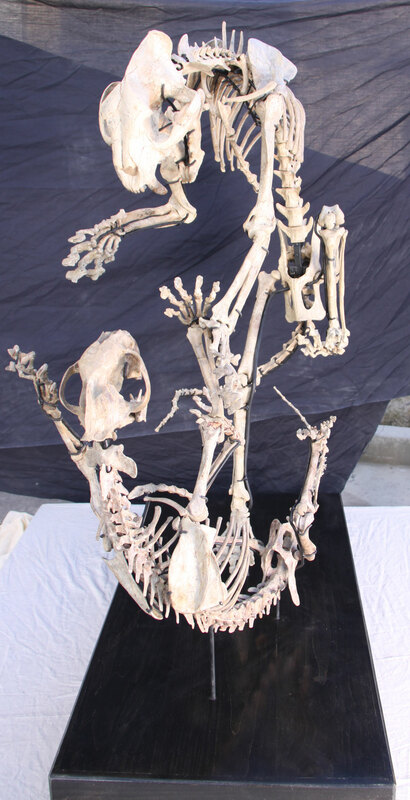 Taxonomic Comment: The difference in size of the two skeletons may represent different species or examples of sexual dimorphism. The larger one (top) has been referred to as Dinictis squalidens (Cope, 1873). Provenance: Acquired from private estate property. Cleaned, prepared, and reconstructed by David Anderson. Mounted and finished by Fossilogic, LLC paleontology studios in Pleasant Grove, Utah. Description: Both skeletons are exceptional in quality and completeness. Most bones are uncrushed, and the surface texture shows little signs of erosion. By bone count, the bottom and top specimens are approximately 70–80% and 50–60% complete, respectively. The mounted skeletons are properly articulated in a suggestive “battling” pose. The armature is designed to be easily taken apart—each bone can be removed for close study and examination. The impressive skulls show the remarkable dentition adapted for stabbing prey (smilodonty). The teeth are beautifully preserved and unworn, suggesting that the individuals died in their prime (see photo). Minor but accurate restoration and reconstruction work exists on both skeletons. On the skulls, repair and restoration work was done mostly on the cheekbones, the ascending ramus of the mandible, and a few incisors. The impressive upper stabbing canines are original, with only the tips restored. Larry D. Martin.”Fossil history of terrestrial Carnivora”. In John Gittleman, ed., Carnivore Behavior, Ecology and Evolution, 1989, pp. 558–559. For information about acquiring these specimens, please complete this form or contact us directly. Serious inquires only.